Islamic State has claimed responsibility for the deadly terror attacks in Brussels this morning, according to a news agency close to the group. At least 34 people have been killed and nearly 200 injured as terrorists inflicted a new outrage on a European capital. Coordinated bomb attacks on the main airport and Metro system in Brussels left a major city in lockdown once again less than five months after Paris was hit by a wave of deadly strikes. A suicide bomber struck first near the American Airlines desk at Brussels airport, with local media reporting that shots were fired amid shouting in Arabic. A US official claimed a suitcase bomb was also detonated. 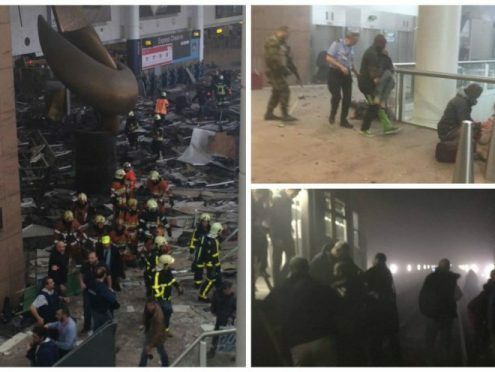 First news of the attacks came when the airport was rocked by a double blast around 7am UK time. The attack on the Metro came about an hour later. Images of passengers climbing from a Metro train into a smoke-filled tunnel near Maelbeek station were reminiscent of scenes following the July 7 attacks in London.